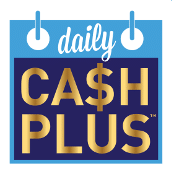 All Daily Cash Plus Lottery draws will be conducted at Global TV, 7850 Enterprise Street, Burnaby, BC, V5A 1V7 on Thursday, January 31, 2019 between 8:00 am and 1:00 pm. Winners will be announced daily on our website, https://millionairelottery.com/daily-cash-plus/ between 8:00 am and 10:00 am as outlined below. Each winner will be contacted by email and/or by phone each day during the same time frame. Winners on Saturday and Sunday will be notified by email on the Saturday or Sunday and /or by phone on the following business day. Saturday to Thursday Winners: Every day, Saturday to Thursday, during the period Saturday, February 2nd, to Thursday, May 16, 2019, there will be two winners chosen each day to each win $1,000 cash. Friday Winners: Every Friday during the period February 2nd, to May 16, 2019, there will be two winners chosen to each win $2,500 cash. The final prize winner will be announced on Friday, May 17, 2019. One winner will be announced to win $50,000 cash.